You brayed (and e-mailed), and we listened. More donkey pictures! 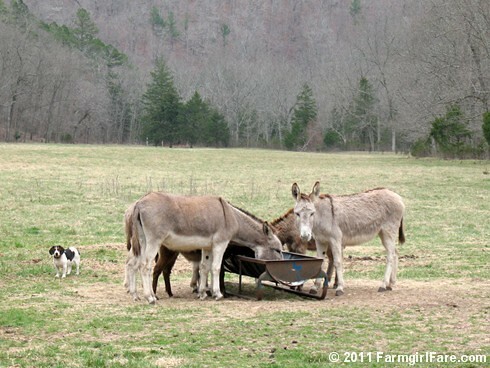 you pleaded, and The Daily Donkey, which began back on February 6, quickly became one of the most popular features on Farmgirl Fare. Thanks so much for all your wonderful feedback and support during the past five months. More below, plus The Daily Donkey 140. . . Fame has its price, though, and our seven lovable longears have announced that after 139 (just about) Daily Donkeys, they're a little tired—and hot. It isn't easy being adorable for so many days in a row, especially as we head back into another predicted week of 106 degree heat index days. It's that time of year when you can't believe you're thinking, Oh good, it's only supposed to be 90 today. The plan is to hopefully devote more time this summer to my growing (and sadly neglected) kitchen garden blog, and to start catching up with some of the numerous backlogged recipes I've been wanting to share. And oh yeah, the ductless a/c system has been installed in the upstairs of the new house, and everything else up there is just about done, so we we really are finally moving! Which means that besides all the extra work moving involves—even if it is just across the farmyard—our satellite Internet connection may be spotty for a little while. Then of course there are all those birthday parties. . .
© FarmgirlFare.com, where it's time to get up and get this party started. Who knows, I might even go all out and make some sour cream and onion dip to go with the champagne and potato chips (and carrots). I've been reading about the donkeys for a few years now, and I really love them; but I have to ask this really stupid question. Do they do anything besides looking cute and doing cute things? You probably mentioned it, but I don't recall. Just curious. Love the donkeys, but my first love is gardening (& food!) which brought me to discover your blog in the first place - so I'm stoked! Thanks Farm Girl! Cute definitely goes a long way around here, especially when it comes to donkeys. The plan when I originally acquired Donkey Doodle Dandy on a whim was that he would live with the sheep and help protect them from predators (especially all the coyotes around here), but it turns out that Dan isn't really a livestock guarding kind of donkey - and neither are Daphne and Dolores, the two girlfriends I bought him a few years ago, or their kids. We're fine with that, though, since Daisy and Marta, our big livestock guard dogs, are doing an excellent job of guarding the sheep (and the rest of us). Right now, our donkeys are pretty much kept around for their entertainment value - which is priceless. Who needs TV with a herd of donkeys around? They're also really friendly and just fun to hang out with. That said, they do some guarding, and they help keep down weeds in the fields that the sheep won't eat. And donkey manure is great for the garden! You're moving out of the shack?!!!! Finally? for real??? How excited are you! Wow!